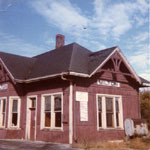 Grand Trunk Railroad Station, Acton. Beardmore warehouse (Old Hide House) stands on right. Steam freight train at the Limehouse Station. Canadian Pacific Railway Station at Hornby. Mansewood train statin on 5 sideroad showing Mr. Cecil and John Bradshaw. Photo copied courtesy of Mrs. E.R. Wilson, Milton.